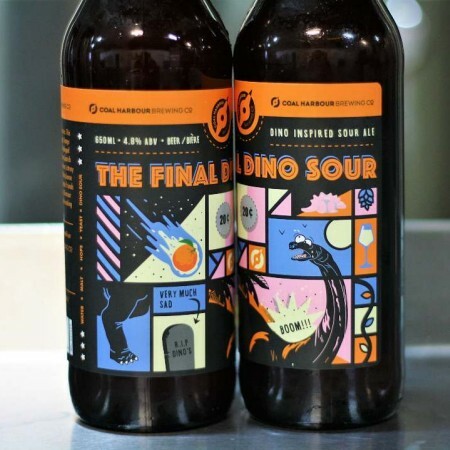 VANCOUVER, BC – Coal Harbour Brewing has announced the release of the last in a series of beers inspired by its head brewer’s love of Dino Sour gummy candies. The Final Dino Sour is based off of arguably the best colour/flavour in the candies, ORANGE! Generous amounts of blood orange, orange peel, and orange blossom honey ensures that this sour beer is still perfect for our mild fall weather. We didn’t want to stop there, and decided to also dryhop this beast, and then age it on Spanish Seville Orange to pack in as much flavour devastation as that orange meteor is about to. The Final Dino Sour is available now in 650 ml bottles at Coal Harbour and select private liquor stores while supplies last.